What is wrong with my blog title? Nothing if you ask my husband. At this moment I'm sitting in the front yard watching my husband attempt to create a tree of lights. He's suspending the cacophony of light strings from a high limb (over sixteen feet high) on a tree in our front yard. I'm not finished yet. He just asked me "how does this angle look?" As if I know better than the doohickey he's using to measure the angle of the string of lights as he pulls it from center and stakes it into the ground. That's right. Each string of lights must stretch to the exact same angle from its anchor high in the air. Measured precisely with a doohickey. How does the math come in? 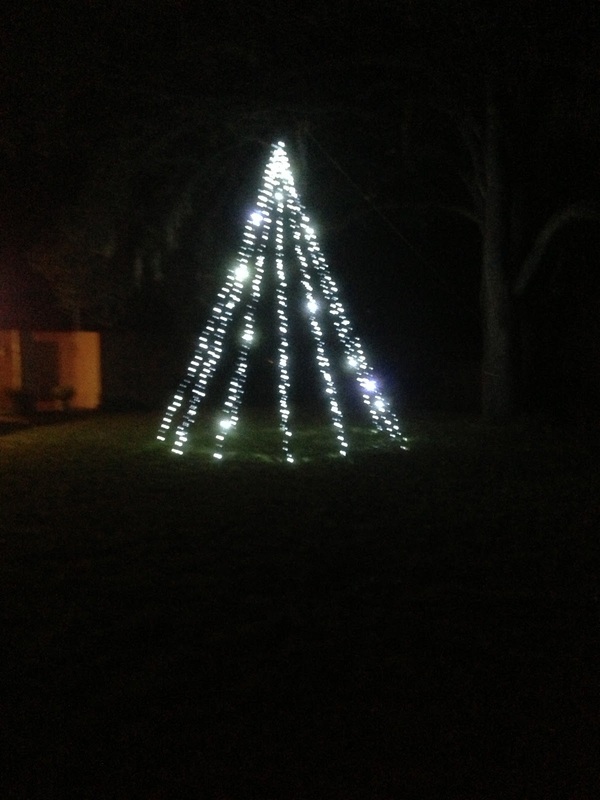 Dear hubby calculated with his mind and iPad how high the strings needed to be to give the lights the exact angle that would create the perfect "tree" or in math terms a cone of lights. So, before he figured the exact height he was raising and lowering the strings of lights. Each time having to wrap the excess rope around the very wide trunk of the tree. Up go the lights. Around the tree goes my husband. Down go the lights. Around the tree goes dear hubby. I haven't quite figured out why the long tubes of PVC are present, but he just returned from the garage with a second one. Something about "measuring" dear hubby muttered. We have a tape measurer stretched out on the ground under the strings of lights along with the long PVC pipe bisecting it at some angle he finds important. Meanwhile, all measuring devices have been abandoned to untangle the 12 strings of light hanging limply from their anchor attached to the rope slung over the tree limb. But I do see progress. The fourth string of lights is being staked into the ground after dear hubby uses the angle measuring doohickey to find the precise angle. It's a four-sided triangle. Or a pyramid as my husband corrected me. I must say, it's a nice evening. I'm sitting in the early evening in shorts and sleeveless shirt listening to Christmas carols streaming from Pandora over our Prius' speakers. Of course, no project in our home, or outside it, in this case, isn't complete without one or more trips to Home Depot. This current trip is to pick up the dozen extension cords required to light each strand individually. Oh, right, I forgot to tell you the most important part. Dear hubby is going to control each strand's lighting ability separately from each other. Possibly to music, doubtful it will happen this year, but for sure they will light to some type of pre-determined pattern. With four strings anchored it looks like its back to the iPad for more calculations to determine where the next string should be anchored. Of course my offer of "just stretch each string out until it reaches an anchor point and be done with it" was met with scowls and mutterings of it won't look like a tree (cone)". Did I mention this is our second night of working on this project? Yep. Uh oh, I just heard a muttered "oh, sh**". That cannot mean things are going well. Should I ask if everything is okay? No, I've learned from previous projects. Just sit quietly and watch. Which may not be much longer. Dear hubby just muttered that its getting harder to see with the light fading. Hey, I just helped! Hubby asked me to bring him the yard stick from the garage. Obviously two PVC pipes and two measuring tapes weren't enough math for this scientific project, but the yard stick would fill the apparent void. I'm sure it's all going to come together now. All dear hubby had to do was ask me and I could easily tell him what his project needed, but no, he goes for a sixth measuring device. I think the tree of lights will be finally built tonight. Dear hubby seems determined. He even got a soft pad to kneel on. To his credit, he already worked all day at a friend's house installing a roof vent. However, I did hear him mutter something along the lines of "at least I know what I'm doing now". It does seem to be going faster. There isn't quite as much silence, or number of Christmas songs go by, between each tapping of the hammer. Math and Science is failing dear hubby. I heard him say, "I don't understand why I have to make this string so much longer. Every other one is the exact same length." One PVC pipe has been discarded to lay forgotten in the yard a bit away from the actual work site. It looks like the yard stick is doing the job. Once again my help was needed to untangle the three remaining strings of lights. It really looks like a tree of lights. Of course they aren't lit. Remember the earlier mention of extension cords. They still need to be purchased. And after many hours of work, including calculations, PVC pipe, a yard stick, hammer, stakes, and an angle measuring doohickey the lights are strung, stretched to the precise angle and anchored. So, I wonder if I should ask about putting a star on top? Uh oh, the lights' plugs aren't polarized. Possible problem. One trip to Home Depot later and we were back home lighting the tree. Dear hubby had a brief but insane idea of putting one of our Christmas inflatables in the center. The Santa helicopter. 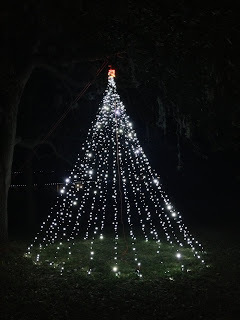 I agreed in principal but after a few minutes of my husband dwelling on the possibility, he came to his senses, and then suggested he just add more strings of lights. In different colors so that when he automates them he will have more sequencing options. I tactfully said, "not tonight. Tomorrow is another day." Lets hope he's moved on to the next project. P.S. I must amend my previous blog. The tree of lights has become an OBSESSION with my husband. He's worked hard on it every night since he first erected it, and now it has become a tree of 24 strings of lights along with a string of colored lights at the top. It is truly a thing of beauty. He did get some automation working with the original 12 strings of lights, but adding the extra 12 has caused some functioning errors. Not to mention the number of muscles he pulled in he back and neck while working on this thing. So, I don't think we'll have any automation this year, but I know that isn't going to stop dear hubby from thinking about it all year, and working on it so that by next year, it will not only flash on and off in various sequences but it will do it to music blaring from speakers he will undoubtedly set out near the tree. Maybe we'll move before then. It's easier to offend neighbors you haven't known for fourteen years. Here is the tree. It does look beautiful, doesn't it? My husband is great fodder for potential blogs. That's how I look at every situation. It keeps me from being mouthy and turning a bad situation worse. M. Darville, thanks so much! I enjoyed yours as well, that scary Christmas book makes me think of Tim Burton and his Christmas movie.